Iceland is a dream destination for many. A place where Earth, in forceful constant change through glacial and volcanic activity, fairly demands a place in the spotlight. We were very excited at the chance to experience her hard work first hand. Our visit would certainly be intense. The many desired stops around the island had to be squeezed into a narrow time window, pushing us on almost regardless of weather and mood. With ten days to circle the Ring Road, and several hundreds of possible destinations on our itinerary, it's a challenge to stay focused on the single most important thing: To breathe in once in a while, and enjoy each moment before it has passed away. But the journey was also intense in a more positive way. The incredible variety of nature took us by surprise - even after months of planning! Within a few days day one can move between tranquil fjords, immense crammed bird cliffs, powerful waterfalls, green pastures with grazing sheep and the occasional natural hot pot, and mountains of almost any color and shape. It is amazing - but too much at once will only lead to overwhelm. We had the opportunity to visit Iceland in late May to June of 2018. May is too early to visit the Highlands, with the mountain roads still covered with snow and closed. Hence we were excited to learn that the Ring Road offers an astounding variety of things to see and do along its course - just look at our map with points of interests! Planning tip! If you have created your own Google map for points of interest, you can add other Google maps with points, such as a gas station map, our POI map or one of the many others shared online. Simply open the new map in your browser, click the 3 dots at the top right of the map legend. Choose the alternative to download KML, go to your own Google map and choose import KML. We decided to circle Ring Road 1 clockwise from Reykjavik. Skipping the bikes and climbing gear due to continued travelling after Iceland, we opted to do only hiking and sightseeing. Maybe, if we're unbelievably lucky, we may return with the bikes another day - but then it better be sunny. May is off-season in Iceland. The month is more budget-friendly and less touristy than high season in June-August, but can be more challenging to plan. Buses to the interior usually start running in June, and even along the Ring Road there is a possibility of snow in May! If you will be driving, it's a very good idea to always keep updated on the road conditions, and maybe on the opening of mountain roads. Read the guide on how to drive in Iceland, and this excellent highland driving guide if heading to the interior. Hikers should know that many of the summits lining the Ring Road are snow-capped in May. You'll probably be alone if you go mountain hiking this time of year, and some areas are better just saved for summer (Hornstrandir). If you want to do a longer hike, you can add some safety by registering it with https://safetravel.is/. Regarding weather, we had read that on average, May is the sunniest month in Iceland. Our experiences are anecdotal, but we did get a surprising amount of sunshine hours although the trip started with a great Icelandig storm. We probably had temperatures between 10 - 20 degrees C most days, and hail only once (during the storm). Also note that many areas are still recovering from winter. Sensitive, popular areas may be closed for visitors. Keep updated. In places where the snow has only just melted, the green grass you see on photos online will be a dull brown, and birch forests might be coming into leaf or barely sprouting. We came in the time of sprouting, and would love to go back later in summer to see the land lush and the mountains more accessible. There's no getting around the fact that Iceland is very expensive to visit these days. Given the country's popularity with tourists, and the need to offer infrastructure withstanding natural forces and protecting the sensitive natural environment, the high price tag is not fully incomprehensible - and some expenses are motivated for their value. If you can afford to, support the local communities. If not, budget travel is not impossible! Staying in campings is in some ways easier, as you don't have to book a year in advance (often you don't have to book a site at all). We spent most nights in campgrounds or bivouaced (where that is allowed, and following strict no-trace principles). A few nights with bad weather were eased by youth hostels, which can offer cooking facilities that help reduce costs. With transportation, sharing a rental car with others is cheaper than tickets for long distance buses. And last but importantly, by careful planning you become your own guide around Iceland - pick out the raisins of the cake, do it all in your own time, and save a lot of money! 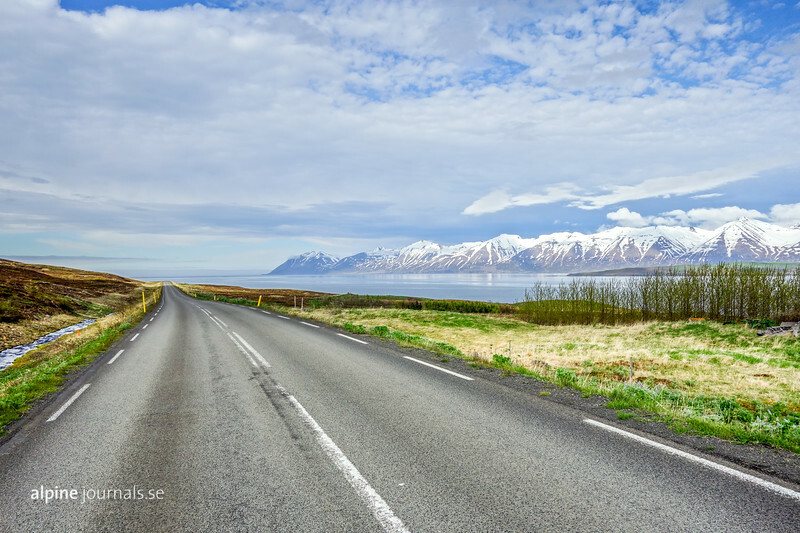 The interior of Iceland can't be reached by an ordinary car – you will need a 4×4 vehicle and good driving skills in order to travel safely there. But even for a roundtrip along the Ring Road, we found that renting a 4WD is worth the cost unless always sticking to the Ring Road. Not only can road conditions vary significantly under ideal circumstances, but the infamous Icelandic weather can make driving a challenge even on tarmac. Also, having the freedom to do your own exploration, in your own time, adds so much to the feeling of spontaneous adventure! Book online for the best price, and do include basic insurances. But look out for the most incredible bargains - we've read about people being fooled by a few tricky rental companies (beware the bad reputation of Green Motion, 4×4 Car Rental and Sad Cars, source). As mentioned, for two or more people travelling together renting a car can actually be the most economic option, since long distance bus passes are very expensive. On the other hand, specialized busses can in some places go in terrain where a smaller 4WD car cannot! If you want to go to the same stops that the buses offer, and have the possibility to start and end a journey in different places, eg. for long hikes, a bus pass may be the right option. It depends on the desired itiniery. Note, though, that some of the buses only operate in high season, which is quite short in Iceland! We cooked our own food in hostel or campground facilities or on our gas stove. To keep costs down, bring what you need from home to increase self-sufficiency, buy only the provisions you actually use, and be flexible about the types and brands of groceries. We were surprised to find a few food items cheaper than at home, like chia seeds and canned beans. The price tag of most other foods make you want to live on chia seeds and canned beans for the duration of your vacation. All dairies, charcuterie and meat, cakes and bread… really, most edibles are expensive compared to European supermarkets. On a positive note, several supermarkets in Iceland offer "less-than-perfect" fruit at a discount - a great idea to reduce both the consumer price and food waste! Well done, Iceland. Secret note: If you drink coffee, bring a cup with you to the store! You'll be surprised at how often supermarkets and gas stations offer the black gold, sometimes even for free, but the price is always reasonable. Just be decent about it and only fill the cup if you are a customer in the store. Palettes of black and white to vibrant earth colors. Landscapes barren and remote, yet alive, constantly reshaping through glacial and volcanic activity. 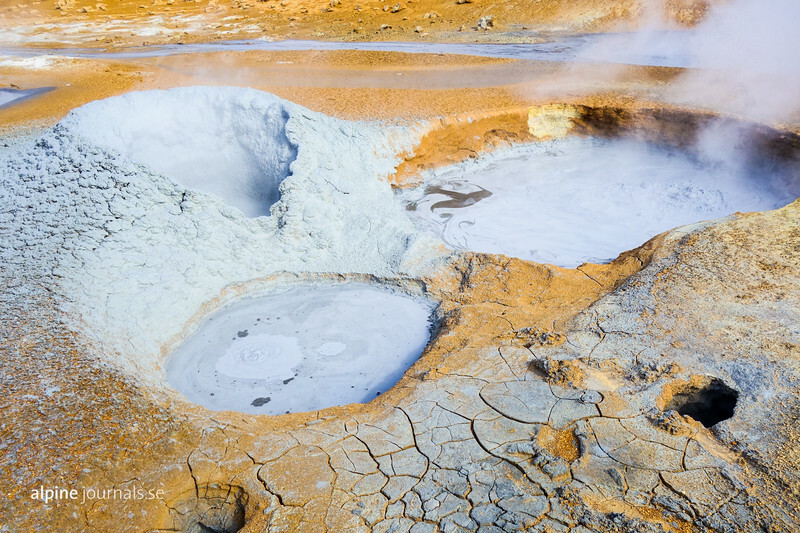 Steaming fumaroles, bubbling pools and spouting geysers reveal the ceaseless activity beneath the thin crust of Earth. Iceland's landscapes are both bizzare, humbling, and uniquely stunning. 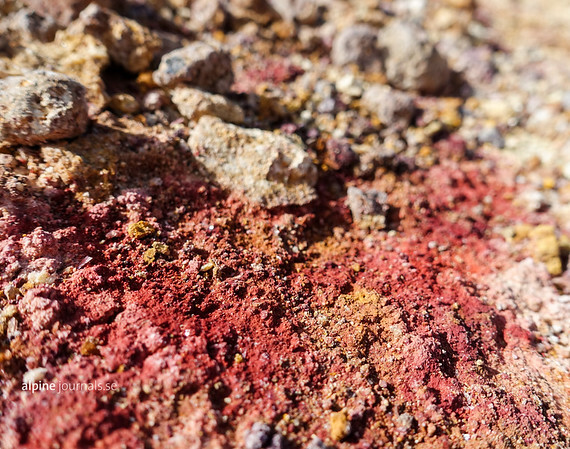 Vivid colors from mineral deposits near Gunnuhver hot spring. 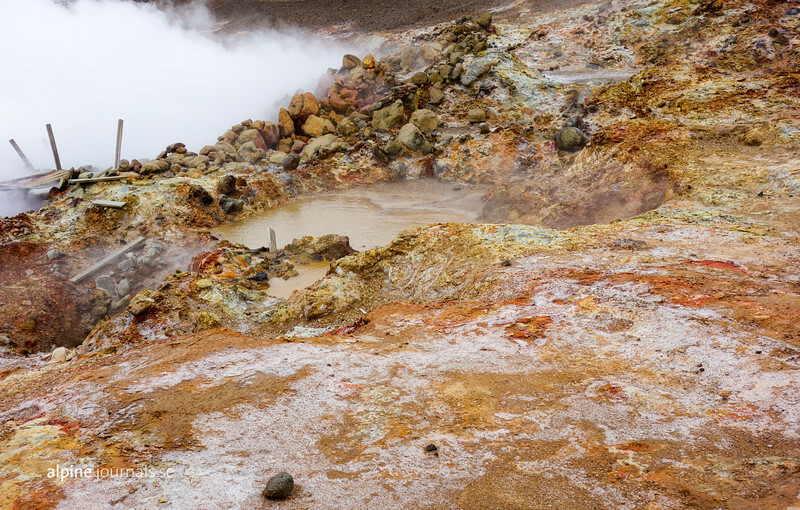 Located on the south-western tip of the Reykjanes peninsula, the Gunnuhver geothermal area is partly fed salt water from the nearby sea. 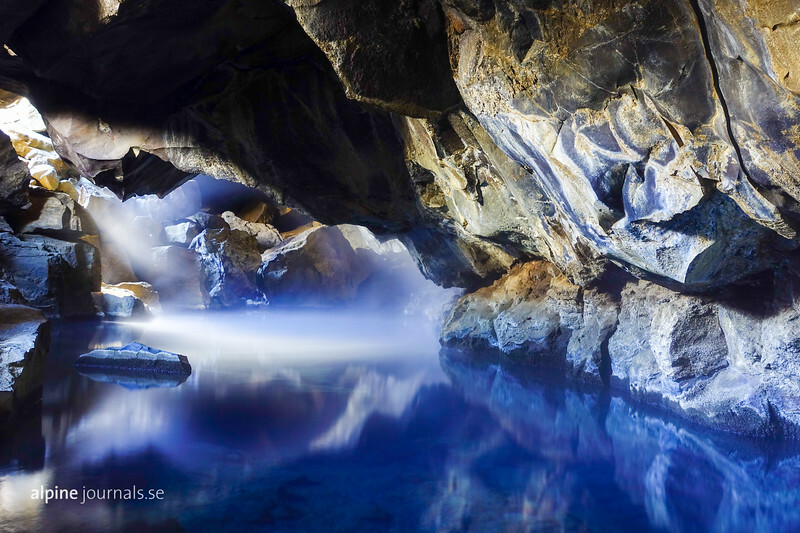 This makes it special among high temperature geothermal areas. It can be seen most prominently at Kísilhóll, a nearby hill with unusully rich deposits of silica sinter. Almost out of view to the left - too steamy to photograph today - is the largest mud geysir in Iceland. Gunnuhver is named after Gunnu, short for Gudrun, who lived here on the Reykjanes peninsula in the 18th century. It is said that when her home was taken to balance a debt, she grew mad at the injustice done to her. She soon died, but continued to haunt the area as a ghost, ruthlessly killing the people who had hurt her in her life. It wasn't stopped until a priest trapped her ghost in the spring that we know as Gunnuvher today. And Gunnu seems to remain active, occasionally swallowing bridges for visitors around her spring. 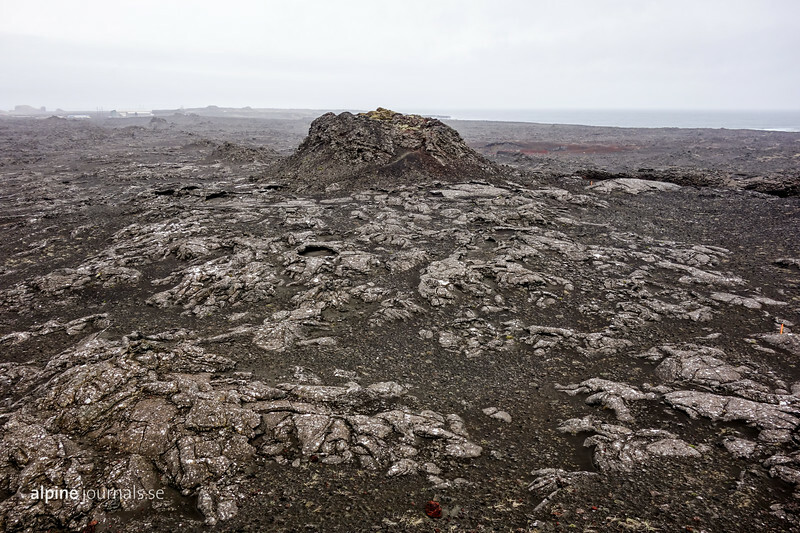 Soon after leaving Gunnuvher on the Reykjanes peninsula, dark lava landscapes grasp our attention. This is one of two small craters, both called Stampar, at the northern end of Stampar crater row. Stretching from the sea to here, a double fissure system has lined up a series of craters including both small scoria cones like these, and larger craters such as Miðahóll and Eldborg. 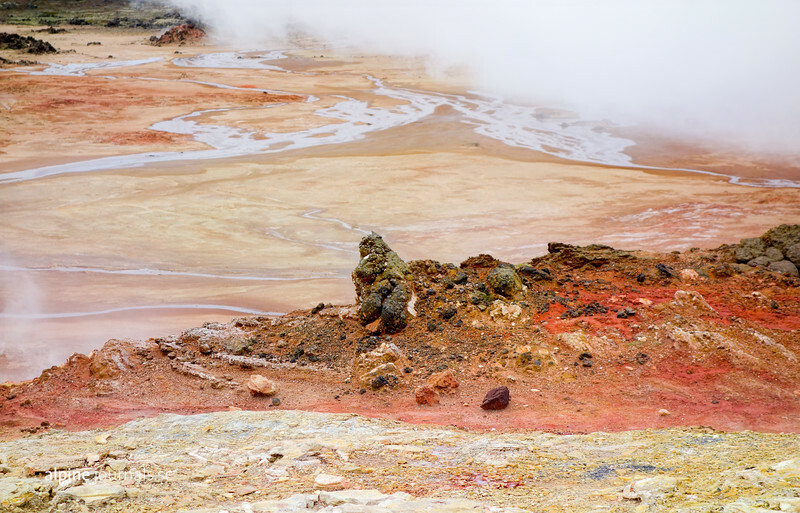 No less than four fissure systems cross the volcanically active Reykjanes peninsula, and there are several geothermal areas and volcanoes that would be interesting to visit. However, today there's an infamous Icelandic storm raging, so we'll settle with these scoria cones just by the roadside on route to Reykjavik. Looking down into the crater of Grabrok volcano. Its location just by Ring Road 1 north of Reykjavik makes Grabrok a very accessible and worthwhile destination. 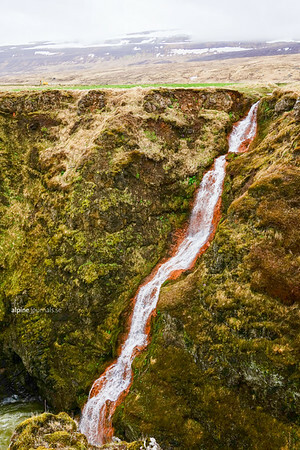 A narrow waterfall cuts into the wall of Kolugljúfur, a 25-50 meter deep canyon in north-western Iceland. 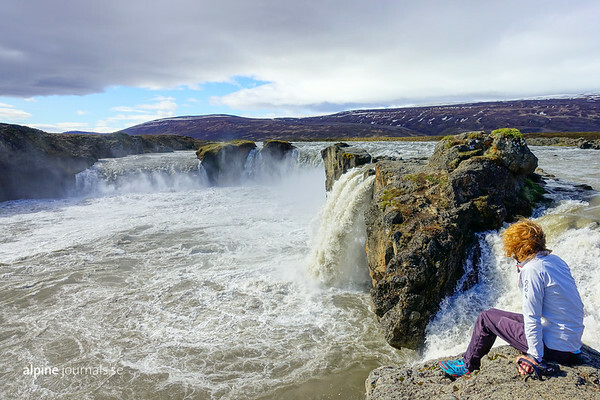 The canyon boasts several waterfalls and - of course - its own Icelandic troll legend. Steep-sided Kolugljúfur canyon in moody weather. 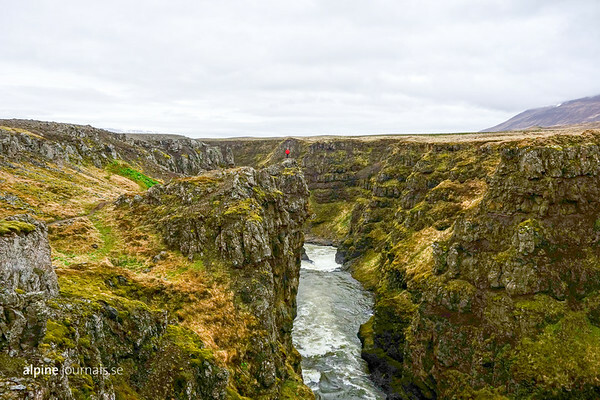 Kolugljúfur is named after Kola, a female troll in Icelandic folklore who is said to have dug this gorge. 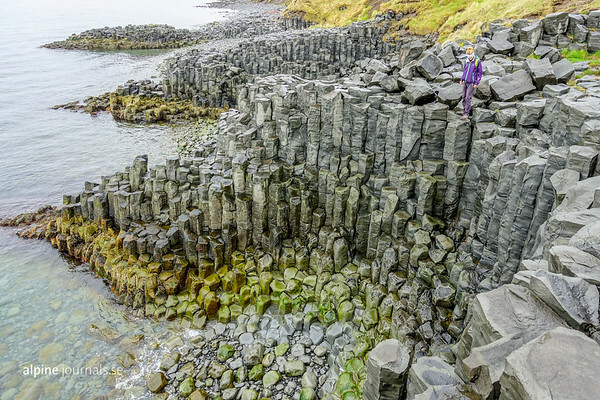 Basalt columns near Hofsós, on the Troll peninsula in northern Iceland. According to legend, this is an elf village! Staðarbjörg is easily accessessed from Hofsós and well worth a visit. 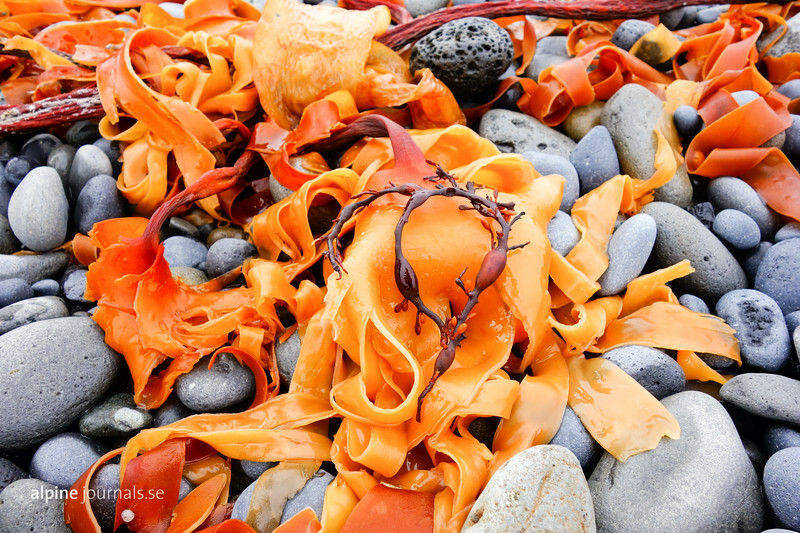 Natural decoration: seaweed on a pebble cape to Þórðarhöfði headland, north-western Iceland. Much of the Icelandic coast line seems to offer views like this: the many fjords and bays allow a vista of snow capped mountains across the water. This photo is from Eyjafjördur above Akureyri in norhtern Iceland. 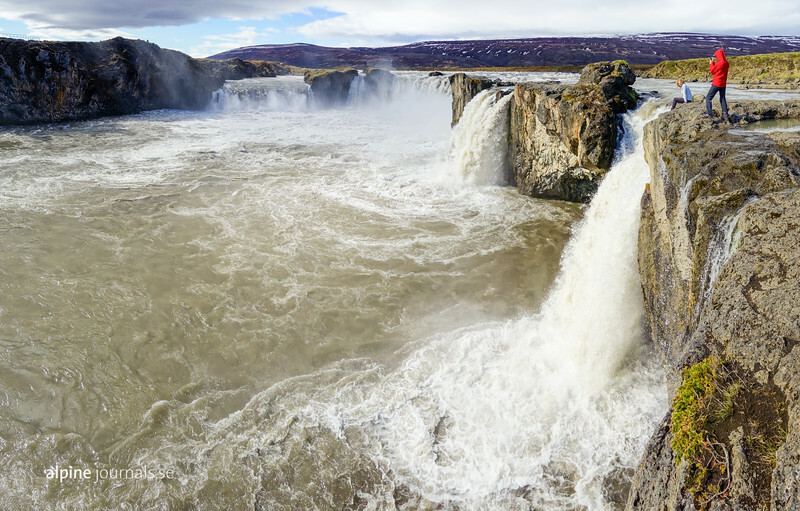 Goðafoss, where lawspeaker Þorgeir Ljósvetningagoði is said to have thrown his statues of the Norse gods after he had declared Christianity to be the official religion of Iceland. 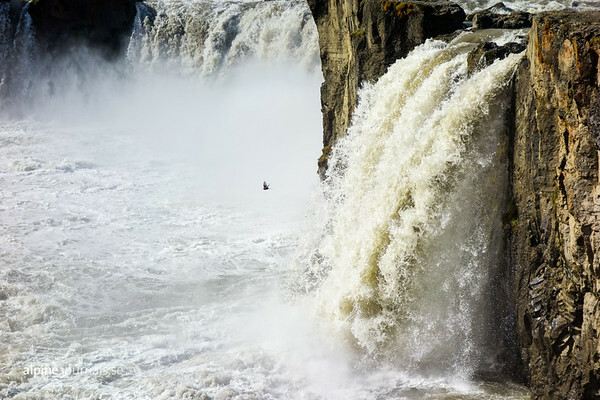 A bird circling around the powerful falls of Goðafoss. From the Lonely Planet guidebook: "The Skútustaðagígar pseudocraters were formed when molten lava flowed into Myvatn lake, triggering a series of gas explosions. These dramatic green dimples then came into being when trapped water boiled and popped, forming small scoria cones and craters. The most accessible pseudocrater swarm is located along a short path just across from Skútustaðir, which also takes in the nearby pond, Stakholstjörn, a haven for nesting waterfowl." This view shows part of Skútustaðagígar pseudocraters and the land arm dividing Stakholstjörn from Myvatn. The crater rim of the Hverfjall volcano, near Myvatn lake (just visible to the right/west). The rim can be circled, as we did, or one can descend to the south, down to the volcanic landscape Dimmuborgir. According to an informative sign at the trail head, the crater is believed to be among the largest of its type on the planet with a diameter of over 1 km at the rim. 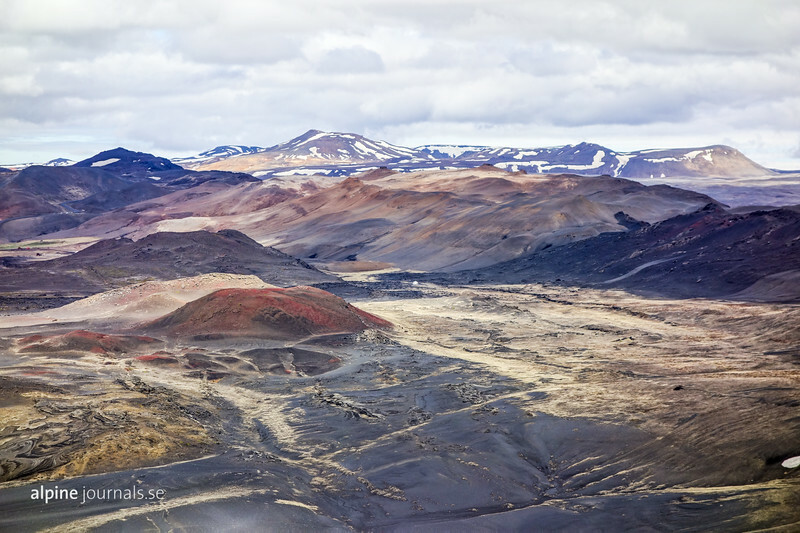 View north from the Hverfjall crater rim to Krafla volcano in the distance. 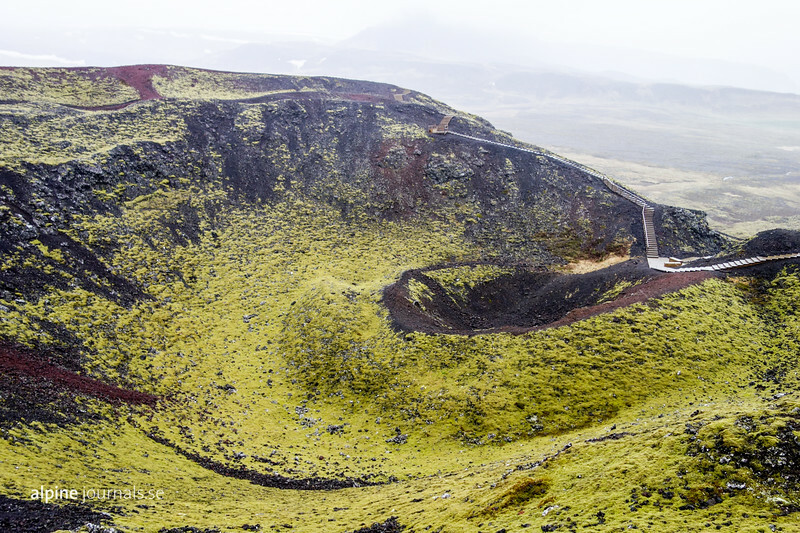 Before it, the shoulder of Námaskarð stretches from left to right, and closer by a few smaller, free-standing colorful hills rise over the lava fields. 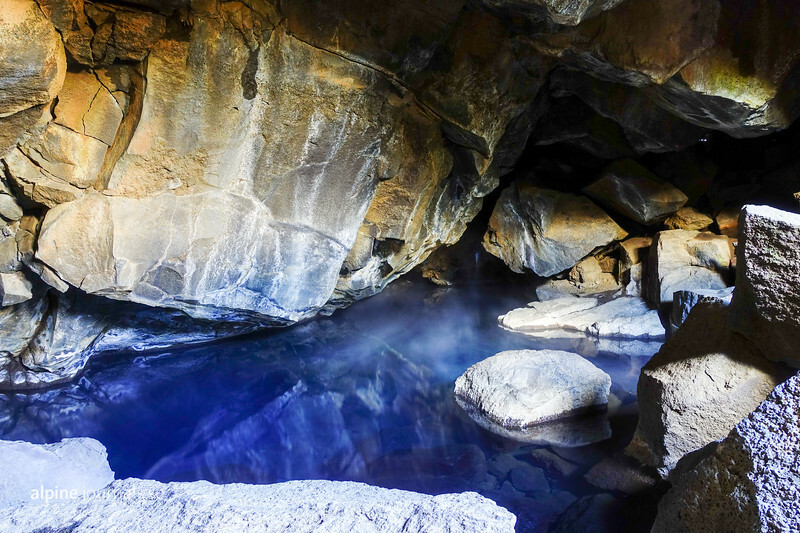 The famous water-filled caves of Grjótagjá. The water is hot, but bathing is not permitted. Apparently, Grjótagjá was a filming location for the Game of Thrones series. Before visiting Iceland, we had thought of a handful of destinations that we hoped would encapsulate the very essense of Icelandic splendour. 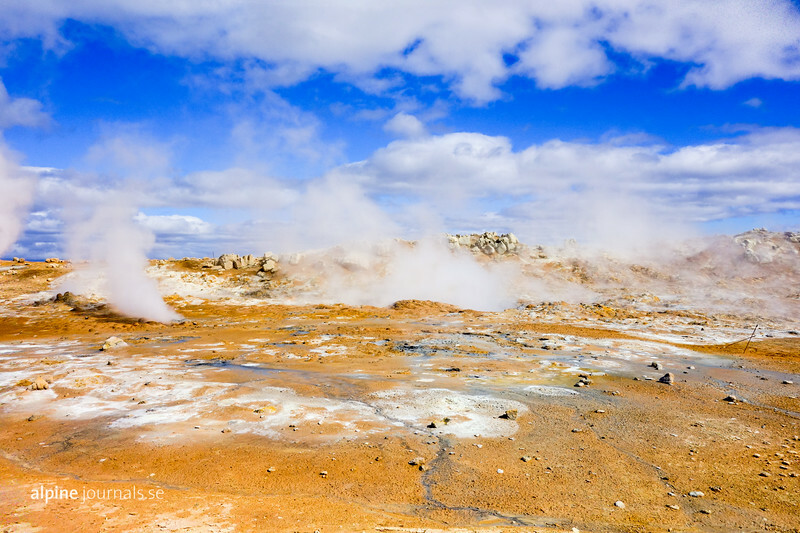 Seeing with our own eyes a live display of the forces of Earth, as it bubbles and steams in a high-temperature geothermal zone, was certainly amongst the most desired. 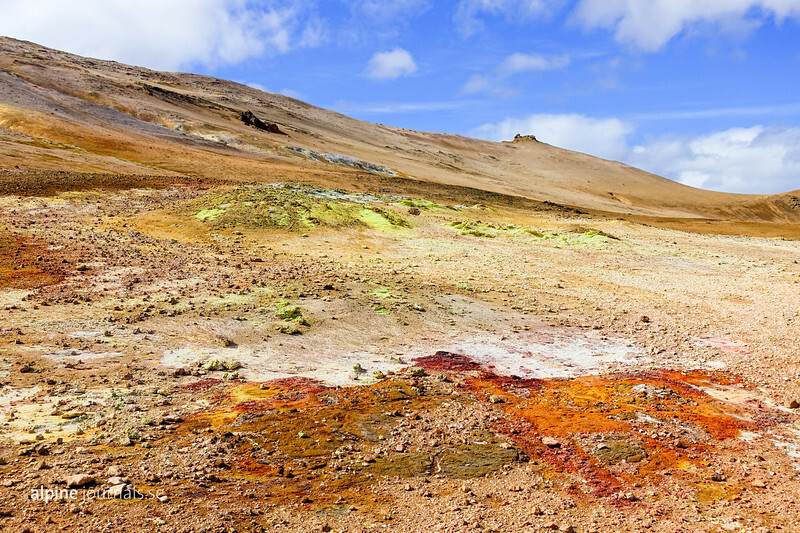 East of Mývatn, just past the mountain pass Námaskarð, a plain full of bubbling mudpools, steaming vents and hissing fumaroles begs for attention. 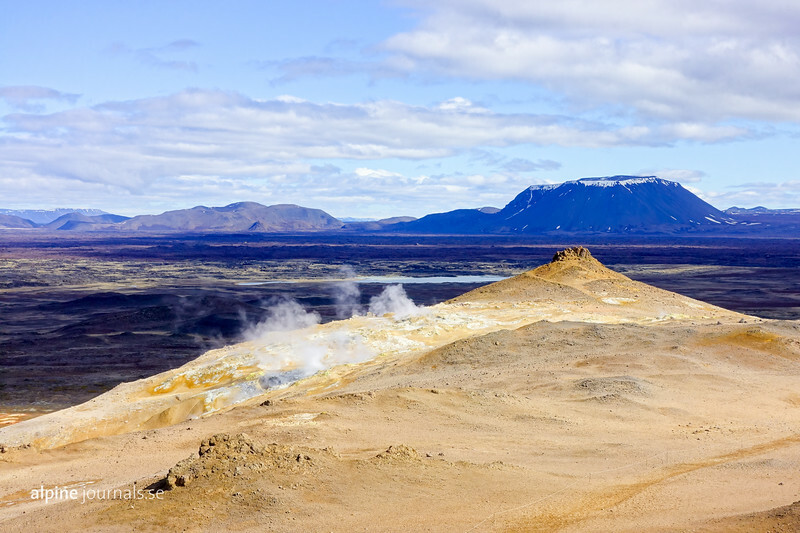 The Hverir geothermal area is just as beautiful as it is accessible. Situated just by the Ring Road 1, with boardwalks and paths leading around the geothermally active area is an attractive stop for any traveller, and on any shedule. One can stop for a quick look at the impressive mudpools nearby the parking, or continue up to the smooth ridge of Námafell. The earth is on fire! Steam rising from vents and pools in the Hverir geothermal area. 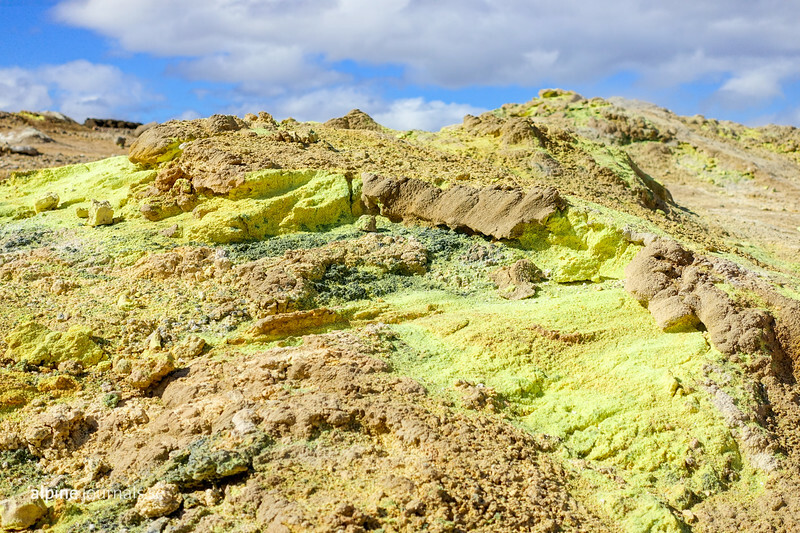 Bright yellow sulphur deposits around a fumarole at the foot of Námafjall. 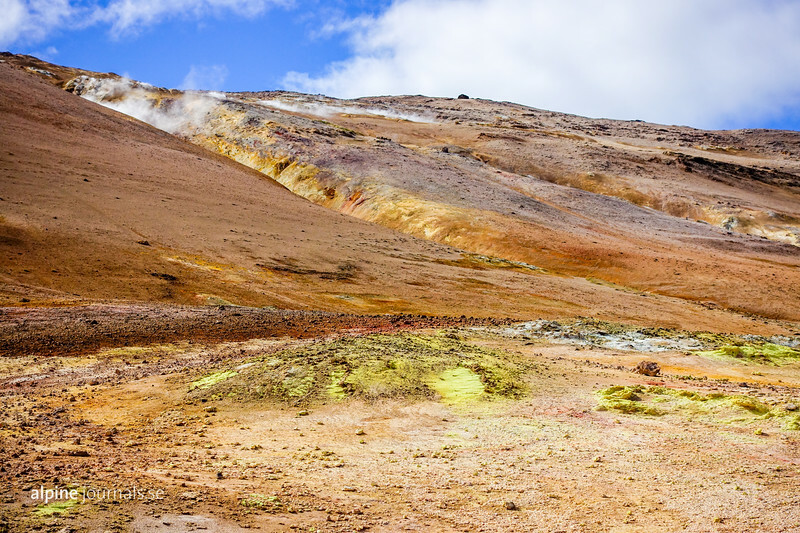 Fumaroles on the eastern slopes of Námafjall give an amazing display of color from deposited minerals. Sulphur deposited around a fumarole at Námafjall. From Hverir, continue the trail up to Námafjall ridge for a gorgeous view over this incredible landscape. Hverir geothermal area to the east is not the only geothermal zone around. Námafjall mountain houses fumaroles and vents, and its western slopes are used for energy production. Further west is the norhtern shore of lake Mývatn, to the south the symmetric cone of Hverfjall crater, and to the north Krafla volcano rises prominently. Mountains wrap the far horizon, and in between, immense lava landscapes stretch out in moody dark hues. Mineral deposits at Namafjall near Myvatn.